Purpose: To assess the beneficial or harmful effects of systemic prophylactic antibiotics at extraction of teeth, apart from third molars, vs no antibiotic or placebo administration. Furthermore, if antibiotics are beneficial, to determine which type, dosage, duration and timing of administration is the most effective. Materials and Methods: The Cochrane Oral Health Group's Trials Register (to 30 January 2016) and MEDLINE (1 January 1950 to 30 January 2016) were searched. There were no language or date restrictions placed on the searches of the electronic databases. Randomised controlled trials (RCTs) of parallel group design, with a follow-up of at least 2 weeks, comparing the administration of various prophylactic antibiotic regimens vs no antibiotics to people undergoing extraction of teeth, not including third molars, were included. Outcome measures were postoperative complications/adverse events, post-operative pain and swelling. Screening of eligible studies, assessment of the risk of bias of the trials and data extraction were conducted in triplicate by three independent review authors. Results were to be expressed as risk ratios (RRs) using a random-effects model for dichotomous outcomes, with 95% confidence intervals (CIs). Heterogeneity, including both clinical and methodological factors, was to be investigated. Results: No relevant RCT was identified. Conclusions: There is no RCT to determine if the antibiotic therapy is needed at extraction of teeth, excluding third molars. Properly designed and conducted RCTs are needed to understand the role of the antibiotic therapy for tooth extraction. Conflict-of-interest statement: This systematic review was self-funded and the authors have no conflict of interests to declare. Purpose: To evaluate the outcome of two vs four implants placed flapless in fully edentulous mandibles and immediately restored with metal-resin screw-retained cross-arch prostheses. Materials and Methods: A total of 60 patients from two different centres were randomised: 30 to the fixed-on-2 group and 30 to the fixed-on-4 group according to a parallel group design. To be immediately loaded implants had to be inserted with a minimum torque of 40 Newton/cm (Ncm). Outcome measures were prosthesis and implant failures, complications, and marginal bone level changes. Results: Flaps were raised in 18 patients. Two implants in two patients did not reach the planned insertion torque and were replaced immediately by larger diameter ones. Three years after loading, two patients dropped out from the fixed-on-2 group and one from the fixed-on-4 group. No implant failure or prosthetic failure occurred. A total of 12 fixed-on-2 patients were affected by one complication each vs 13 fixed-on-4 patients. There were no statistically significant differences for complications between groups (difference in proportion = -0.03; 95% CI -29 to 0.22; P [Fisher's exact test] =1.000). There were no statistically significant differences for marginal peri-implant bone loss between the two groups (mean difference = 0.14; CI 95% -0.17 to 0.45; P [ANCOVA] = 0.356), with both groups losing marginal bone in a statistically significant way (1.70 mm for fixed-on-2 implants and 1.56 mm for fixed-on-4 implants). There were statistically significant differences between the two centres, with more bone being lost for the Bologna centre (2.18 vs 1.13 mm; P (ANCOVA) < 0.001). Conclusions: Up to 3 years after loading, these preliminary results suggest that immediately loaded mandibular cross-arch fixed prostheses can be supported by only two dental implants. Longer follow-ups (about 10 years) are needed to properly evaluate this therapeutic option. Conflict of interest statement: This study was completely self-financed and no funding from the implant manufacturers has been sought or obtained, not even in the form of free materials. Purpose: To compare the outcome of site preparation for zygomatic oncology implants using conventional preparation with rotary drills or piezoelectric surgery with dedicated inserts for placing two zygomatic implants per zygoma according to a split-mouth design. 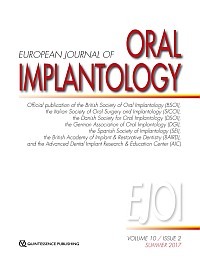 Materials and Methods: Twenty edentulous patients with severely atrophic maxillas not having sufficient bone volume for placing dental implants and less than 4 mm of bone height subantrally had their hemi-maxillas randomised according to a split-mouth design into implant site preparation with conventional rotational drills or piezoelectric surgery. Two zygomatic oncology implants (unthreaded coronal portion) were placed in each hemi-maxilla. Implants that achieved an insertion torque superior to 40 Ncm were immediately loaded with screw-retained metal reinforced acrylic provisional prostheses. Outcome measures were: prosthesis and implant failures, any complications, time to place the implants, presence of post-operative haematoma, and patient's preference by independent assessors. All patients were followed up to 1 year after loading. Results: In two patients drills had also to be used at the piezoelectric surgery side to enable implant sites to be prepared. One implant for the conventional drill group did not achieve an insertion torque superior to 40 Ncm since it fractured the zygoma. No patients dropped out and two distal oncology implants failed in the same patient (one per group), who was not prosthetically rehabilitated. Six complications occurred at drilled sites and three at piezoelectric surgery sites (two patients had bilateral complications), the difference being not statistically significant (P (McNemar's test) = 0.375; odds ratio = 4.00; 95% CI of odds ratio: 0.45 to 35.79). Implant placement with convention drills took on average 14.35 ± 1.76 min and with piezoelectric surgery 23.50 ± 2.26 min, implant placement time being significantly shorter with conventional drilling (difference = 9.15 ± 1.69 min; 95%CI: 8.36 to 9.94 min; P < 0.001). Post-operative haematomas were more frequent at drilled sites (P = 0.001), and 16 patients found both techniques equally acceptable, while four preferred piezoelectric surgery (P = 0.125). Conclusions: Both drilling techniques achieved similar clinical results, but conventional drilling required 9 min less and could be used in all instances, although it was more aggressive. These results may be system-dependent, therefore they cannot be generalised to other zygomatic systems with confidence. Conflict-of-interest statement: This study was partially supported by Southern Implants (Irene, South Africa), the manufacturer of the zygomatic implants and the conventional drills evaluated in this study. However, data property belonged to the authors and by no means did the manufacturer interfere with the conduct of the trial or the publication of its results. Drs Felice and Pistilli developed the piezoelectric surgery zygomatic insert used in the present study. Purpose: To compare the clinical and radiological outcomes of identical implants with conical or internal hex connections. Methods: A total of 90 patients with partial edentulism requiring one implant-supported prosthesis were randomly allocated in two equal groups (n = 45) to receive either implants with a conical connection or implants of the same type, but with an internal hex connection at three centres. Patients were followed for 1 year after loading. Outcome measures were implant failures, any complication and marginal bone level changes. Results: One patient (2.2%) belonging to the internal hex group dropped out. One implant (2.2%) failed in the conical group. There were no statistically significant differences in implant failures between the two groups (2.2% vs. 0%, difference 2.2; 95% CI: -1.3; 5.7; P = 0.315). Two complications occurred in the conical group and two in the internal hex group (P = 1.000, difference 0.00, 95% CI: -3.1; 3.1). The 12-month peri-implant bone resorption was similar in both groups: 0.56 ± 0.53 mm (95% CI 0.03; 1.09) in the conical group and 0.60 ± 0.62 mm (95% CI 0.02; 1.22) in the internal hex group (difference = 0.04 ± 0.55, 95% CI: -0.51; 0.59, P = 0.745). Conclusions: Within the limitation of this study, preliminary short-term data (1 year post-loading) did not show any statistical differences between the two internal connection types, therefore clinicians could choose whichever connection they prefer. Conflict of interest statement: Tommaso Grandi serves as consultant for J Dental Care, Modena, Italy. This study was completely self-financed and no funding was sought or obtained, not even in the form of free materials. Purpose: To test the hypothesis that there is no difference in clinical, radiographic and aesthetic outcomes positioning single post-extractive 7 mm-diameter implants or waiting 4 months after molar extraction and socket preservation procedure. Material and Methods: Patients requiring one implant-supported single restoration to replace a failing tooth in the molar region of both maxilla and mandible were selected. Patients were randomised according to a parallel group design into two arms: implant installation in fresh extraction sockets grafted with cortico-cancellous heterologous bone and porcine derma (group A) or delayed implant installation 4 months after tooth extraction and socket preservation using the same materials (group B). Implants were submerged for 4 months. The primary outcome measures were the success rates of the implants and prostheses and the occurrence of any surgical and prosthetic complications during the entire follow-up. Secondary outcome measures were: peri-implant marginal bone level (MBL) changes, resonance frequency analysis (ISQ) and pink esthetic score (PES) values at implant placement (baseline) up to 1 year after loading. Results: Twelve patients were randomised to group A and 12 to group B. No patient dropped out within 1 year after loading. No implant and prosthesis failed and no complications occurred during the entire follow-up. One year after loading, statistically significant higher mean MBL loss was experienced in group A (0.63 mm ± 0.31 mm) compared to group B (0.23 mm ± 0.06 mm); difference 0.41 mm (95% CI 0.17-0.53; P = 0.001). Six months after implant placement, mean ISQ value was 78.8 ± 2.8 for group A and 79.9 ± 3.6 for group B, showing no statistically significant difference between groups (difference 1.1; 95% CI: 0.04 to 2.96; P = 0.422). One year after loading, mean PES was 10.6 ± 1.8 [range: 8 to13] in group A and 12.2 ± 1.2 [range: 11 to 14] in group B. The difference was statistically significant (1.6 ± 2.7; 95% CI -0.55-2.55; P = 0.019) with better results for group B. Conclusions: Within the limitations of this study, both procedures achieved successful results over the 1-year follow-up period, but waiting 4 months after tooth extraction and socket preservation procedure was associated with less marginal bone loss and a better aesthetic outcome. Conflict-of-interest statement: Dr Marco Tallarico is Research Project Manager of Osstem AIC Italy. However no company supported this study and all authors declare no conflicts of interest. Purpose: To compare outcomes for immediately loaded one-piece implants (OPI), placed flapless, and conventionally loaded two-piece implants (TPI), placed after two-stage flapped surgery. Materials and methods: Thirty-eight participants were randomised to receive either one OPI (19 participants, OPI group) or one TPI (19 participants, TPI group) inserted in the posterior mandible with a torque of at least 35 Ncm according to a parallel group design. OPI were immediately loaded with non-occluding temporary crowns. After 3 months, TPI were exposed and implants in both groups were occlusally loaded with zirconia crowns. Outcome measures were implant failure, prosthesis failure, any complication and changes of probing pocket depth (PPD), plaque index (PI), gingiva index (GI), and peri-implant marginal bone level, recorded by unblinded assessors. Results: Three years after occlusal loading, three participants dropped out from the TPI group. There were no statistically significant differences between the groups with regard to participants with implant failure (OPI group 1/19; TPI group 0/16; difference in proportions (DIP), ?5.3%; 95% confidence interval (CI) ?15.3 to 4.8; P = 1.000), prosthesis failure (OPI group 3/19, TPI group 5/16; DIP, 15.5%; 95% CI ?12.6 to 43.5; P = 0.424), any complication (OPI group 6/19, TPI group 5/16; DIP, ?0.3%; 95% CI ?31.2 to 30.5; P = 1.000), or changes of PPD (P =0.174), PI (P = 0.222), or GI (P = 0.415). Veneer chipping accounted for most prosthesis failures and complications. On average OPI and TPI lost 1.34 mm and 0.67 mm of marginal bone, respectively, the difference between groups being statistically significant (mean difference, 0.66 mm; 95% CI ?0.02 to 1.34; P = 0.024) in favour of TPI implants. Conclusions: Both implant procedures might be viable in the short term, but statistically significantly more bone loss might be indicative of future problems with OPI. Because of the high incidence of chipping, veneered zirconia crowns cannot be recommended on posterior implants. Conflict-of-interest statement: The authors are grateful to Nobel Biocare for providing the study materials free of charge. Money received from the manufacturer was used to reimburse participants for regular attendance at follow-up appointments and to finance data management. The authors declare no conflict of interest. Purpose: The aim of this case series was to compare magnetic resonance imaging (MRI) with cone beam computed tomography (CBCT) in the representation of periapical osteolyses. Based on the histological findings, the potential of MRI for further lesion characterisation was investigated. Materials and methods: Thirteen patients (average age: 41 ± 27 years) with a total of 15 periapical lesions (five molars, five premolars, and five front teeth) were examined. Lesion characterisation was based on the homogeneity/heterogeneity of the lesions, the signal intensity within the lesion compared to the surrounding tissue and differences in the signal intensities between different MRI contrast weightings. Results were compared with CBCT and histological findings. Results: Although all patients presented with dental restorations, such as fixed partial dentures and filling materials, all periapical lesions could be diagnosed with either imaging modality. Histologically, 13 cysts and two apical granuloma were confirmed. In CBCT, the similar appearance of all lesions did not allow any further characterisation. In MRI, radicular cysts and granuloma could be characterised by their appearance in the MRI images with different contrast weightings. The MRI-derived characterisations were consistent with the histological findings. Conclusions: The presented study shows that the application of multi-contrast MRI may lead to better characterisation of apical lesions, thus enabling an improved patient-specific selection of the optimal treatment option. Conflict-of-interest statement: MAG, ESS, and LKS do not report any potential conflict-of-interest; EH and JU are employees of Sirona Dental Systems; VR is receiving a research grant by Sirona Dental Systems. Purpose: To report a case of osteonecrosis of the jaw (ONJ) occurring in an implant area possibly related to denosumab, a relatively new antiosteoporotic agent. Materials and methods: Two months following the extraction of both maxillary first molars, a bilateral maxillary sinus floor elevation was performed on a 64-year-old female patient under a biannual 60 mg denosumab antiosteoporotic treatment. Seven months later, two implants were inserted in a single-stage procedure in each of the grafted sinuses. After 3 months, the implants underwent prosthetic rehabilitation at one side, and a series of failures that led to an ONJ instalment at the other side. Results: The ONJ persisted over 7 months and was only resolved by a surgical approach consisting of a piezoelectric osteotomy and platelet-rich fibrin with a tension-free wound closure. Conclusions: A cumulative effect of denosumab is likely to be associated with a jaw osteonecrosis, which in this case was manageable using a surgical approach with no need to interrupt the appropriate drug treatment course. Conflict of interest statement: The authors certify that they are not affiliated with, or involved in any organisation or entity with any financial or non-financial interest in the subject matter or materials discussed in this manuscript. This section presents a brief review of articles on dental implants considered of special interest to readers, in order to encourage the development of research, the interest in data analysis and the attention to scientific publications. Your comments are welcome. Please contact Dr Michele Nieri at michelenieri@gmail.com.